Puro is a theme for bloggers, creatives, and small businesses. Puro was designed from the ground up to let your content do the talking. Whether for your blog, portfolio or small business site, Puro’s responsive design is ready to deliver to all devices. At its core Puro is a fully featured blog; close integration with plugins like SiteOrigin’s Page Builder and Jetpack also mean it’s ready to beautifully present your portfolio or small business. Below you’ll find a few of the features we’ve loving packed into Puro. Once you’re up and running, head to Appearance > Puro Premium from within WordPress and check out our premium offering. It adds a host of extra features that we’re sure you’ll love. Clear typography, subtle colours and a beautiful minimalist design make Puro the perfect starting point for your site. Get Puro setup in minutes with just the basics or dive in deeper and fully customize your site with just the right amount of settings. Seamless compatibility with SiteOrigin's Page Builder & Widgets Bundle, Meta Slider, Contact Form 7 and many others. Based on the benchmark Underscores starter theme, Puro's code is thoroughly checked by the WordPress.org team before going live. Keep the focus on your content and imagery. Puro's design is crisp, clean and sure to give your blog the best chance of success. Designed for the mobile environment, Puro is responsive and looks great on tablets on phones. Increase your site's page views and search engine score with a great load time. Puro is lightweight and optimized for speed. 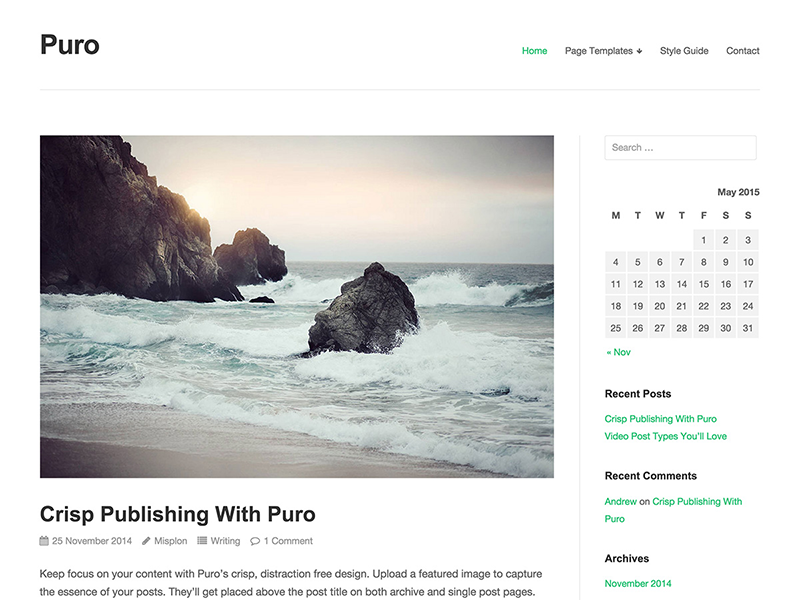 Puro is a versatile free WordPress theme. Premium adds a host of useful features we're sure you'll love. Control your page title, sidebar and content width display with custom templates. Show icons to share your posts and pages on Facebook, Twitter, Google+ and LinkedIn. Remove page re-loads from your comment forms. This means that users can submit comments without losing their place in a gallery or interrupting a video. Use the menu interface to add your networks to Puro's social icon menu. Make Puro your own with enhanced Customizer integration. Change fonts, colors and more all using the live-updating WordPress Customizer. Sell with Puro and WooCommerce, the most popular WordPress eCommerce plugin. Style support included for right to left languages. Translate Puro with a plugin like Loco Translate or use the included .pot file in an app like Poedit. Puro's updates as they're released direct to your Dashboard. Pay what you want from $5. Your order number will be emailed to your PayPal email address. You choose the price, so you can pay what Puro Premium is worth to you. Support threads are prioritized by amount paid. $50 gets you an unlimited mult-site license. Happy customers are our first priority. In the event, however, that you decide Puro Premium isn't quite right for you, we want to make things right. Within 60 days of purchase, we'll refund the full price you paid upon request.